Computers in today’s world have been upgraded with Smarter Operating Systems and Advanced Hardware however slow performance and sluggishness has always been a problem for computer users. No matter how smart your Operating System is, it still requires few tweaking and settings to be done to ensure swift performance. 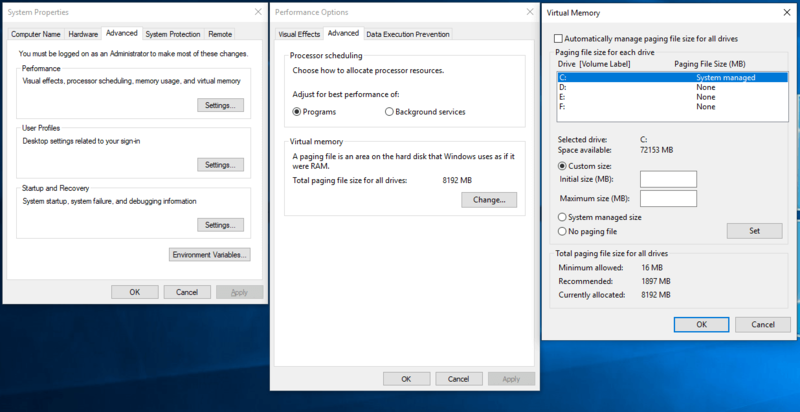 A lot of factors which can bring down the performance are fixed in Windows 10 Operating System however we may still face performance related issues. We will walk you through some small hacks which can fix up all your performance related issues and optimize Windows 10 to run faster. Let’s understand step-by-step process to perform all the above tasks. You always need to ensure that You perform linear and logical process to get desired results. To free up system junk you need to open Temp, %Temp% and Prefetch folders and delete temporary files from the system. Press Win + R key 🡪 to open Run Box 🡪 type %Temp% and press Enter. It will open an Explorer window with all the temporary files under your user account. Select All (Ctrl + A) in the new window and Press Delete Button to remove them. Press Win + R key 🡪 to open Run Box 🡪 type Prefetch and press Enter. It will again ask for administrative rights and open an Explorer window with all the temporary internet files. Select All (Ctrl + A) in the new window and Press Delete Button to delete them. It is also recommended to clean up Browsing Data, Cookies, Cache from your browser. In Google Chrome, you may go to Settings 🡪 Privacy and Security 🡪 Clear Browsing Data and the same path can be followed in Microsoft Edge to clean up Browsing Data. Often you may have witnessed that your system is taking too long to come to Desktop Screen OR allowing you to start your desired programs. You may perform following steps to optimize your startup items. Right Click on Task Bar at the bottom and Click on Task Manager. It will bring up your Task Manager window. Go to Startup Tab where you will find all the startup applications which are Enabled OR Disabled on your system. 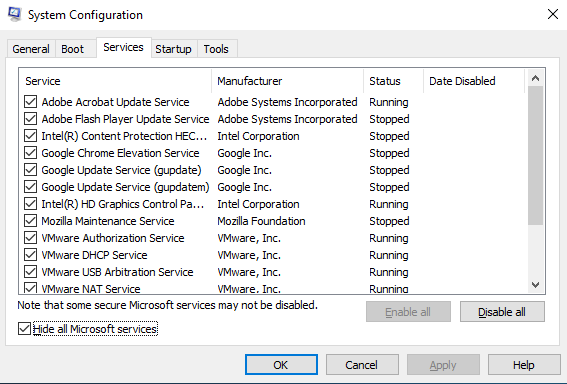 You may Right Click on any unwanted Application and Disable it from Startup. This will free up startup tasks and system will not take ages to reach the desktop screen. Open Run Window (Win + R key) and type in msconfig and press Enter. This will open system configuration window. Click on Services Tab on the top to open services list. Before making any changes, please ensure to put a check in front of Hide All Microsoft Services. Here you need to Remove Check Mark from the service which you wish to disable. Click on Apply and Ok. It will ask you to restart the system which is required to execute the changes. It is essential to have free Disk space to experience swift functionality of system. You may perform following steps to regain your space. Press Win + R Key to open Run Box and type in cleanmgr.exe and press Enter. 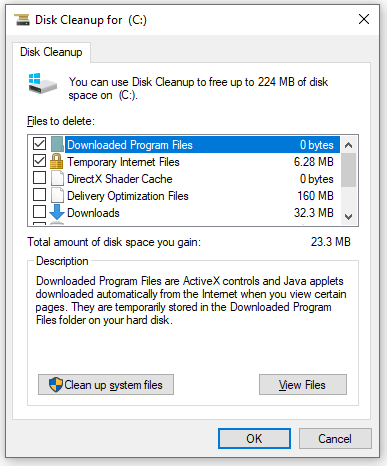 It will open Disk Cleanup Utility and ask you to select the drive you want to clean up. It will run a smart scan and will show you how many junk files are piled up on your drive. You may also Click on Clean up System Files Button at the bottom and Put a check in front of files you want to clean and then Click on OK. Once it is done, it will ask you to restart the system. You may also manually find and delete unwanted Photos, Videos, Movies, and Documents from Windows Explorer window. To do so, press Win + E to open explorer, Select the file you wish you remove and press Shift + Delete key to permanently remove the file. Disk Defragmentation is again one of the options which you should perform to free up Disk space. Press Win + R Key to open Run Box and type in dfrgui and press Enter. It will open optimize drive window where you need to select the Disk you want to optimize and click on Optimize button. It will perform defragmentation and consolidate files on your hard drive to free up Disk space. Switching between different power options is not a difficult task in Windows 10. All you need to do is open Control Panel 🡪 Hardware and Sound 🡪 Power Options and select High Performance option from 3 available options. This option will enhance the performance compromising energy usage. The all new look of Windows 10 may give you exotic feeling however the Graphic User Interface may slow down the performance. Disabling Windows Visual Effects will show you dull colors however will surely enhance the performance of Windows 10. Press Win + R Key to open Run Box and type in sysdm.cpl and press Enter. This will open System Properties window where you need to navigate to Advanced Tab. Under Performance section, click on Settings button. It will open a new window with the name of Performance Options. On Visual Effects Tab, you need to select Adjust for Best Performance option and click on Apply and Ok to make changes. To increase the performance of Windows 10, it is always recommended to install latest Windows Updates. Press Win + R Key to open Run Box and type in control update and press Enter. 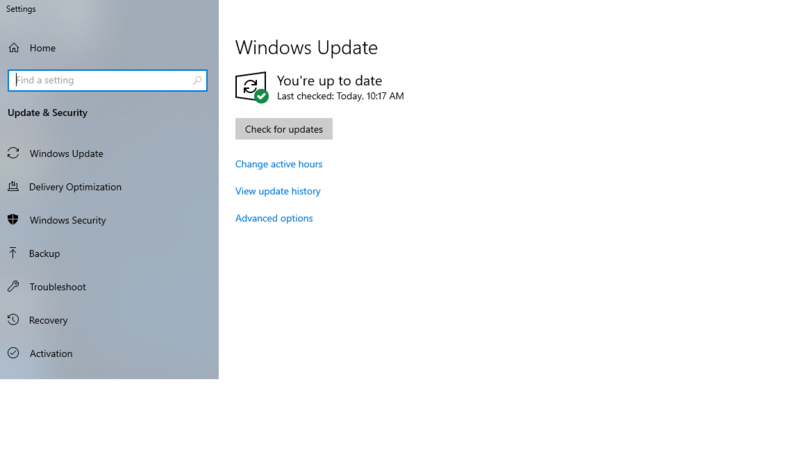 It will open Windows Update window to check for most recent updates. Clicking on Check for Updates button will initiate a scan on the system to look for most recent updates followed by downloading and installing the updates automatically. Once the updates are installed, it will ask you to restart the system. It is also recommended to check for updates of your installed applications and browsers. For example, at the top right on Google Chrome look for 3 vertical dots. If an update is pending, the Icon will be colored as Green, Orange OR Red as per severity. If you are using Windows 10 on an old computer, it is advised to upgrade the hardware components to experience the best performance out of your system. Loading the system with SSD (Solid State Drive) will surely speed up Windows 10 performance. Increasing RAM size will also enhance your experience of computing. Once you realize that the total amount of used Memory is regularly above 80%, it is recommended to add up more memory sticks. It comes in 2 / 4 / 8 / 16 / 32 GB Size. It is always recommended to keep your system secured and Threat free. Windows 10 comes with a Firewall and Windows Defender utility which should be turned ON all the times however these are not enough to keep the system secured. You may install Antivirus, Antispyware, Malware Remover, Trojan Remover and various other software to keep your system safe and secured. You may also follow https://www.systweak.com/advanced-system-protector/ link to install one of the best security software for your computer. You should always schedule weekly scans on your computer to keep it updated and secured. Even if you are running your system with LOW Memory, it is a smart move to tweak the settings of your memory’s Paging File Size. Paging File is a type of Memory which Windows 10 uses to store the data and keep the applications running. To optimize Paging File Press Win + R Key and type sysdm.cpl and press Enter. This will open System Properties window where you need to navigate to Advanced Tab. Under Performance section, click on Settings button. It will open a new window with the name of Performance Options. 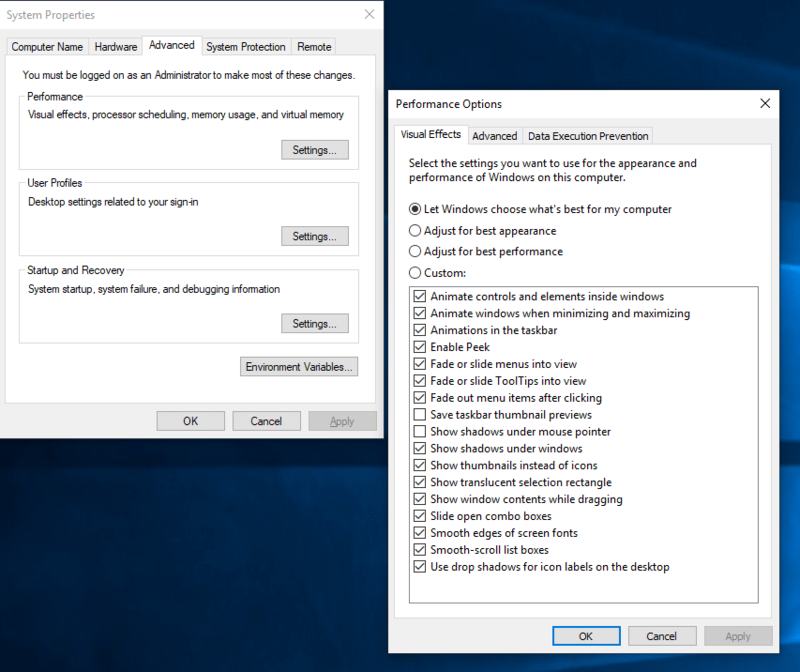 Navigate to Advanced Tab on Performance Options Window. Second section is for Virtual Memory, Click on Change button to make changes in Paging File. Uncheck the option which says Automatically manage paging files size for all drives. Click on Custom Size option and enter the desired Initial Size and Maximum Size. Do remember that Initial Size can be 1.5 times of available memory and Maximum Size can be set as 3 times of the available memory. We often install device drivers which comes with the system. We forget to update latest device drivers which are critical and at times result in nonresponsive state of the system. To check for outdated drivers, Press Win + R Key and type devmgmt.msc and press Enter. 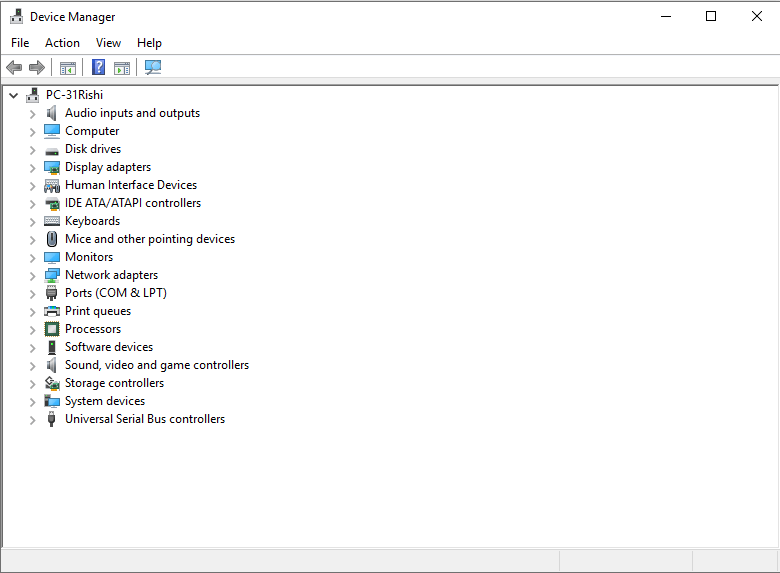 Device Manager window will open with yellow exclamation mark on devices which has outdated drivers. You need to right click on the device and click on Update Driver. Browse through the location where you have downloaded the driver setup from Manufacturer’s website. Now if you are thinking that performing all these steps on a regular basis is a difficult task and any single miss on any step may result in no boot situation, you may also consider using reliable software to perform all these tasks for you. Windows Advanced System Optimizer is a world-class software to optimize your system and reveal its best performance. Advanced System Optimizer is an All-in-one powerful cleanup software to optimize systems running with Windows 10 and earlier versions. There is no need to download dozens of software for different tasks as this single software will solve all your computer issues. Security, Cleaning and Optimization can all be done with one click. 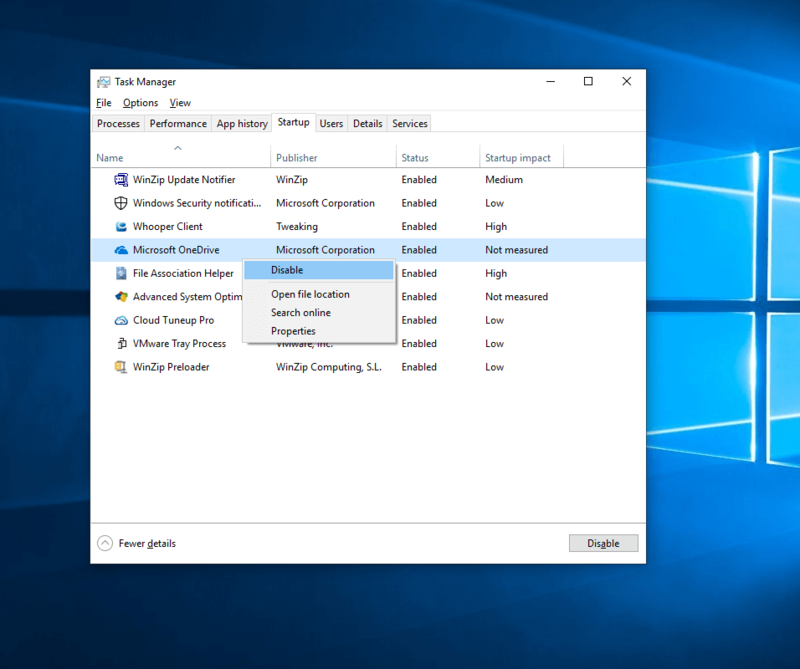 Download Advanced System Optimizer and experience one click magic to speed up Windows 10 with Advanced System Optimizer.